Mary Schaffer, co-owner of Napa & Co in Stamford reached out to local bloggers and invited us to a special, complimentary blogger dinner. 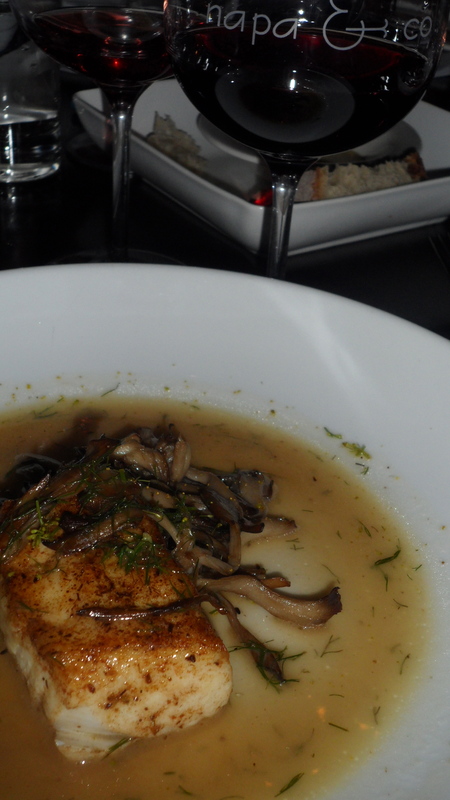 We’ve been to Napa & Co before for Valentine’s Day a few years ago and really enjoyed the food. Well, the same applied this time, and we were able to learn even more about the wine, Chef Arik Bensimon, and Napa & Co. Cooler yet, we chilled with JR from Streets of Stamford, restaurantsCT, and CTbites. Holla. We love to say that: amuse bouche. That just means a small, bite size tidbit given from the chef that “entertains the mouth.” Yeah, these freaking did. Beautifully grilled octopus that had nice grill marks and was perfectly tender and bursting with flavor. And, as if that wasn’t enough, we had pork beignets that were candied, cripsy, and just plain beautiful. The perfect mix of sweet and savory. To. die. for. Mary paired these with the Dayden 2010 Dry Rosé from one of our favorite vineyards, Arizona Stronghold. Yes, the Arizona Stronghold from Arizona that is co-owned by Eric Glomski and Maynard James Keenan from Tool, Puscifer, and A Perfect Circle. Kristien and I swear that he ate at Napa & Co before his concert last year because of our Twitter recommendations and sold Mary on the wine, but maybe that’s just our imagination (or wishful thinking because we’re obsessed with Maynard). He also owns and runs Caduceus and Merkin Vineyards and he stars with Eric in the highly acclaimed film Blood into Wine–a must watch. Local duck egg, atop creamy fontina potatoes. Not amazing enough? Throw in three (count them, three) thick and oh-so-good slices of black truffles. Ooooh yeah, black truffles. That’s like $90 bucks there or something crazy like that. The egg was poached and cooked perfectly and oozed out onto the potatoes, giving a nice contrast. 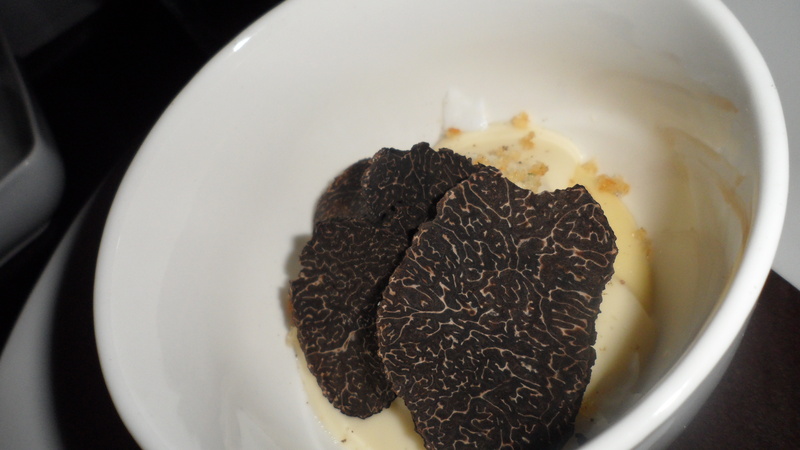 The truffles, while we thought would be overpowering at first, actually added a great depth and earthiness to this course. Mary paired this with Toast by Napa & Co, a nice Brut. 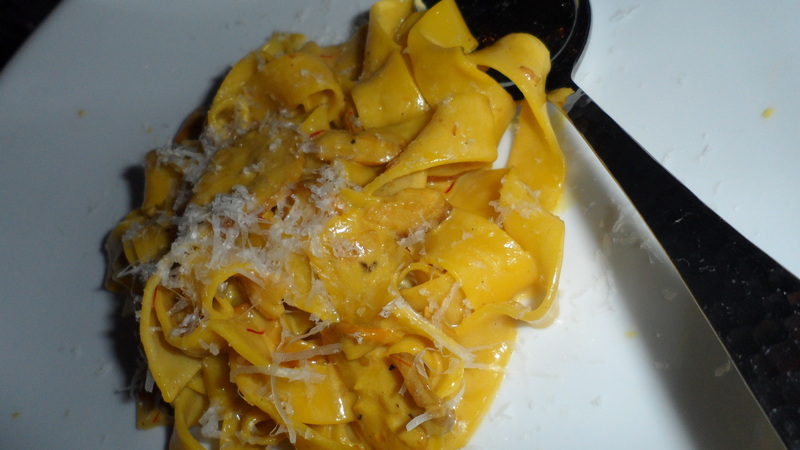 House made fettuccine with oolii mushrooms and saffron. The pasta was cooked perfectly al dente and was served with a creamy sauce with nice bites of saffron throughout. Chef Arik usually has three homemade pasta dishes and sometimes even one magical, hidden pasta dish that’s not always advertised. Oooh, mystery. Mary paired this with a light and buttery 2008 Chardonnay-Viognier blend from Spann Vineyards. Simply perfect. 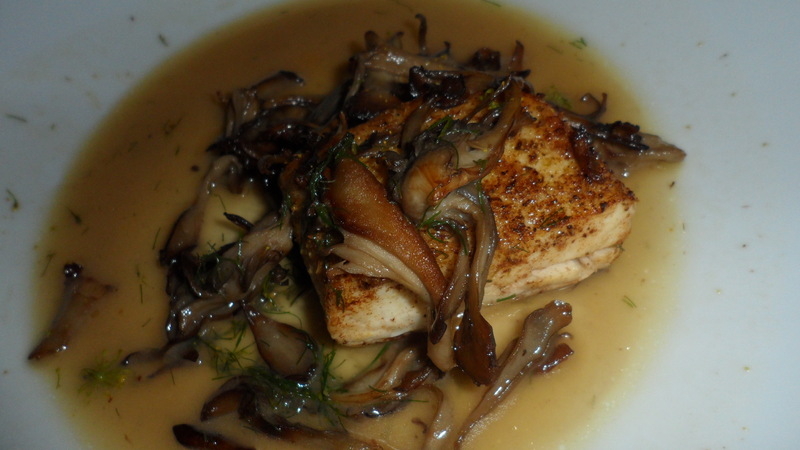 This was one of our favorite dishes. Halibut that was marinated for 20 minutes with salt and fennel pollen, then blanched and pan fried. Serve that up with some flavorful broth and hen of the woods mushrooms, and you’ve got a killer dish. The fennel pollen added an almost floral taste to the meal which really added so much more depth to this dish. Pair this with the 2007 Pinot Noir from Dom. Michel Gros, and you’ve got another ridiculously wicked course. 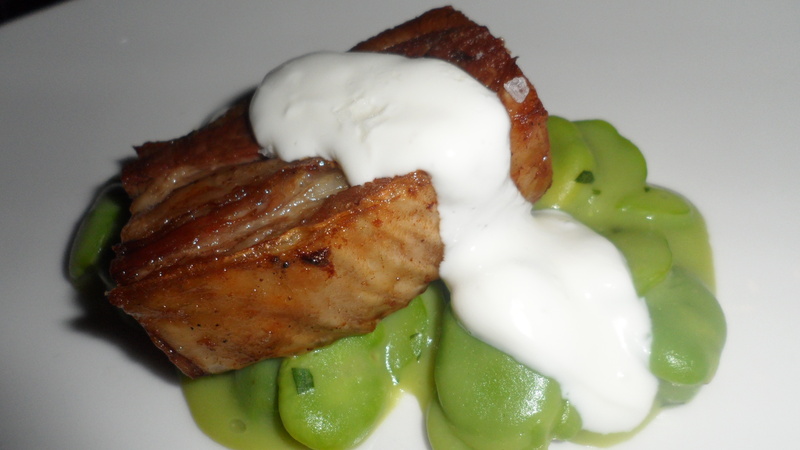 Slow cooked lamb belly, with lemon, chives and tarragon, Beltane Farms yogurt on top, and a Fava bean mash on the bottom. The lamb was tender, juicy and flavored very well. The yogurt was tart and added a wonderful contrast to the inherent fattiness of the lamb belly. Chef Arik sent us out some brussel sprouts and we loaded up my plate: they were caramelized, flavorful, and made us lean back in our seats in awe. This course came with an impressive 2004 Barolo from Michele Chiarlo. 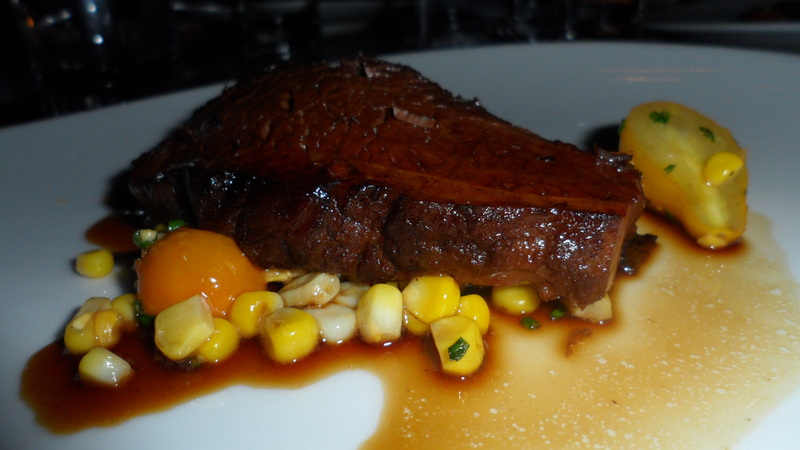 Grass fed brisket with local corn and heirloom tomatoes. The au jus that the brisket and veggies sat in was so earthy and is the stuff of dreams. The brisket itself, though, took it up a few more notches. Delicate, earthy, fall apart on your fork, melt-in-your-mouth-oh-so-goody. Again, a perfect pairing with a 2005 Spanish Tempranillo from Bodegas Ramon Bilbao set the dish off. We were sad to see the last course, but in a way we were so stuffed, we couldn’t have fit anymore. Unlike Kristien, I have a natural hatred of all things cheesecake, so I had a big decision to make during the whole meal. 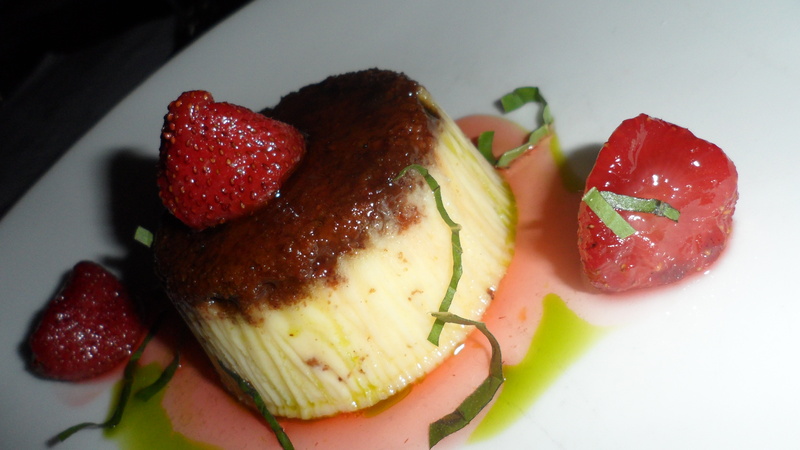 Would I eat the Marscapone Cheesecake that was served with strawberries and basil? At first I wasn’t sure, but just after the amuse bouche I knew that I trusted Chef Arik to give me something that would blow me away. Let me say, this was an amazing dessert. It was not too sweet and just right in terms of creaminess. The little ribbons of basil, too, added nice bursts of flavor to the cake. Mary paired this course with a great Muscat from Rurtherglen that wasn’t overly sweet. Napa & Co is FANTABULOUS on all levels, from ingredients, to wines, to service, to (of course) their dishes. Chef Arik has real, raw, culinary talent. Napa & Co has fresh, flavor-forward taste, that can satisfy even the pickiest foodies and winos. If you’re ever want an experience like this, you can always check out Napa & Co‘s site as well as sign up for their e-mails. They often have wine tastings, wine dinners, and other fun events. You might consider Napa & Co expensive, but you’re certainly getting what you paid for. A tip: try the burger. Damn, holy hell. Blogging is rewarding and lots of fun, but it is also a lot of work. Also, nothing wrong about being tough as long as it’s deserved or honest. there is of course one other issue and it is something that i always must contend with, even though i am not an inspector…free food to a Health Department Employee is a no,no. Many have tried and i simply will not return. My favorite places which will be my “friend”, but always let me pay…it is better that way.